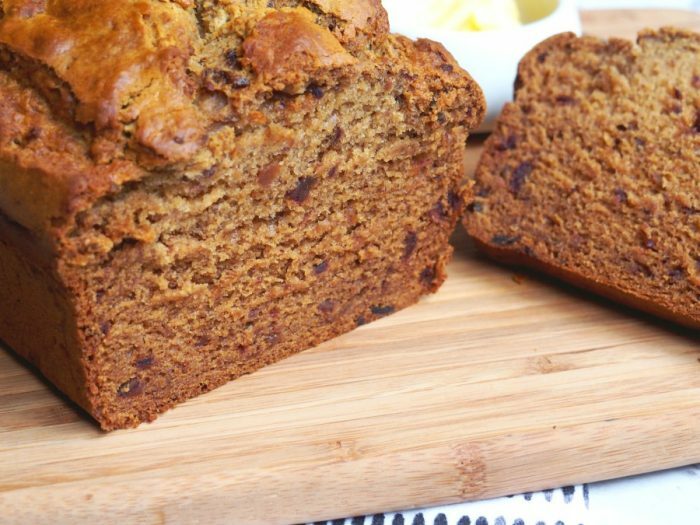 If a sticky date pudding and a banana bread had a bake baby, this loaf would be it. It’s got all the dark, caramelly deliciousness of the sticky date pudding with that lovely moist dense texture of a first rate banana bread. 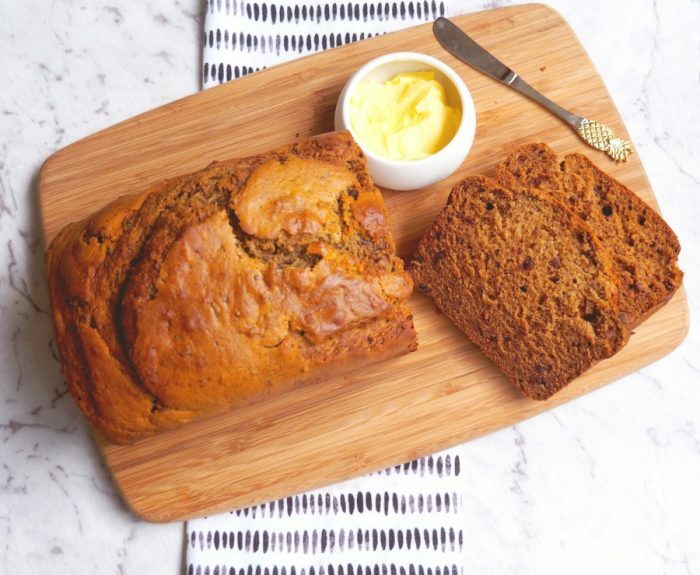 I tried my first banana bread and sticky date pudding when I first came to Australia and I’ve been loving on them ever since. My sticky date obsession knows no bounds, first there was the Sticky Date Cheesecake, then there were the Sticky Date Cookies and then there was the Sticky Date Slice. 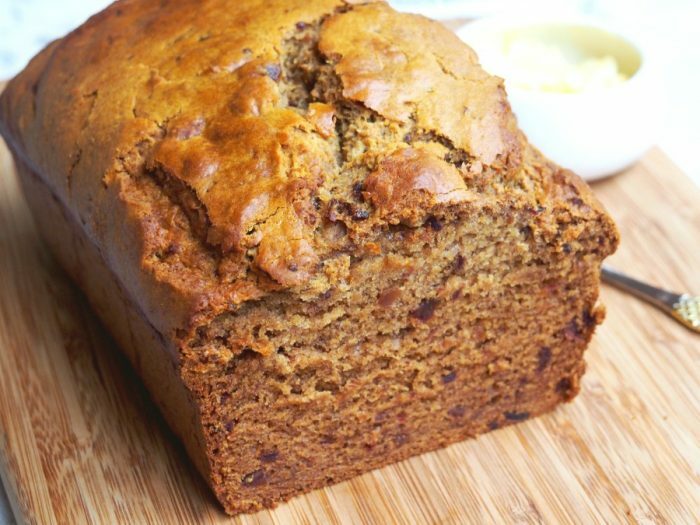 They’re all hands down deliciousness but this banana bread might be my best yet. 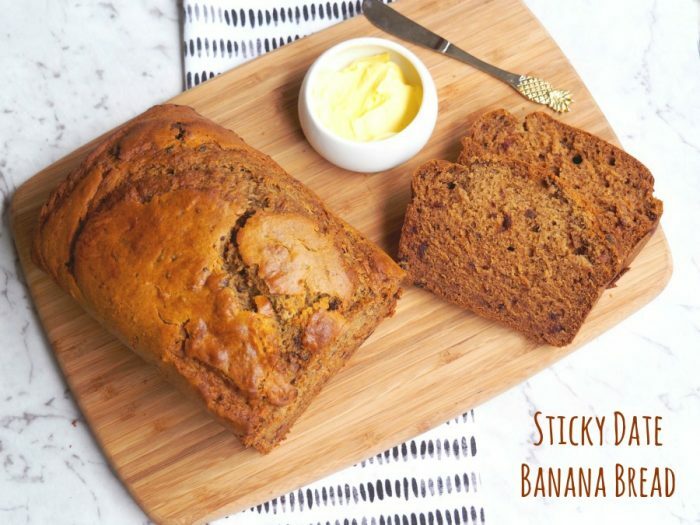 I have had to make this Sticky Date Banana Bread so many times because I couldn’t get the photos right. On the flip side, I got to taste test this loaf within an inch of it’s life but now of course, I’m properly addicted. One slice of this is never enough! I’ve eaten it for breakfast and lunch and even in between. If you want a new way to upcycle your brown bananas, you should definitely try this! Everyone will go bananas for it! 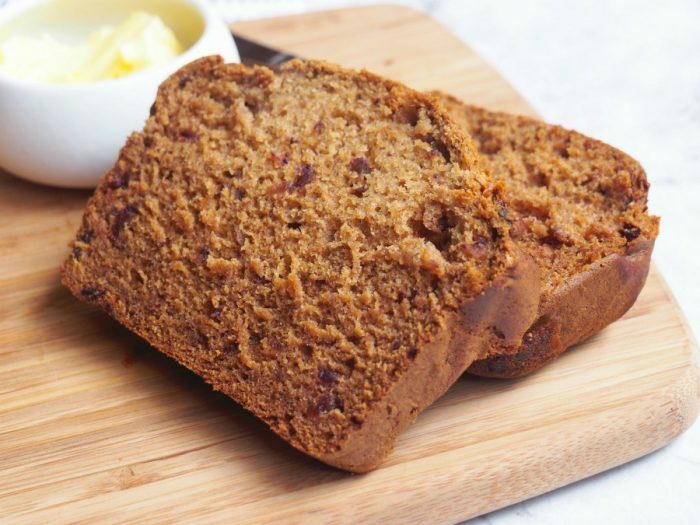 If you could only choose one, what would it be, banana bread or sticky date pudding?! Grease a large loaf pan. Line the base and long sides with baking paper, extending the paper over the sides. Preheat oven to 180C/160C fan-forced. Preheat oven to 180C/160C fan-forced. Place dates in a medium heatproof bowl and cover with boiling water. Leave to stand for 10 minutes. Stir in the soda. Place date mixture and bananas in a food processor and process until combined. Add the flours, sugar, eggs and melted butter and blitz until smooth. Pour into the prepared pan. Cook for about an hour, or until a skewer inserted into the centre fo the bread comes out clean. Cover with foil if cake is browning too quickly. Remove from oven, allow to stand in pan for 15 minutes before turning out on to a wire rack to cool. Serve warm or cold, with a generous spread of butter. Grease a large loaf pan. Line the base and long sides with baking paper, extending the paper over the sides. Preheat oven to 180C/160C fan-forced. Place dates in TM bowl and cover with boiling water. Leave to stand for 10 minutes. Add the soda and mix for 3 seconds on reverse speed 3. Add the bananas and mix for 3 seconds on speed 4. Add the flours, sugar, eggs and melted butter and mix for 10 seconds on speed 5. Scrape down sides and base of bowl. Mix again for 5 seconds on speed 5. Pour into the prepared pan. Cook for about an hour (depending on your oven), or until a skewer inserted into the centre fo the bread comes out clean. Cover with foil if cake is browning too quickly.